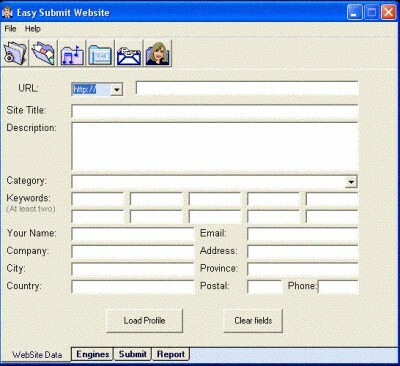 Easy Submit Website 1.0.1 free download. Easy Submit Website is an easy to use yet powerful search engine promoting tool. Easy Submit Website is an easy to use yet powerful search engine promoting tool. Research shows that 85% of web traffic comes from search engines. But if your site is not ranked high enough on the search engines, none of that traffic will come to you. Your competition is all over you. And much worse - on top of you... on search engines! It is very hard to get listed high and if you are not an expert, you will fail for sure. When many search engines index your page, they decide how high to rank them on various keyword searches based mostly on the content of the page and the way it is put together. The search engines guard the criteria they use to analyze the pages, leaving most people to simply guess or follow basic guidelines. And what about submission process? Do you want to submit to all of these important sites manually? We offer you an INSTANT submission service, you will get listed as quick as possible. Meta Tags Retriever is a simple applciation designed for webmasters that need to find other optimized meta tags generated from the top 20 websites ranked in Google. It's very important to have a Site Map so search engines can find all of your pages. Wonder how their pages get listed in the top 10? Well, now yours can be too! Grab keyword tags from the top web page results in search engines just for your own use! MetaTagDummy! is a simple tool to grab the keywords used in the top web page results of search engines and display them for you to use in your own pages. Blog Blaster is an automated tool designed to submit your blogs to over 12 blog search engines on a click of a button. Free 1-hour search engine optimization crash course on the basics of search engine optimization and how to submit to search engines. This SEO book is full with essential tips and guidelines with online web page analyzer tool and major search engine submission links for getting top search engine ranking. The Software Promotion Toolkit is the ultimate solution for your software promotion needs. Web Placement Verifier is a freeware application that will allow you to check your website search engine placement for multiple keywords, to see if your site is in the first top pages of a search engine result for a specific keyword search. Free Monitor for Google is a free web promotion application that was designed for search engine specialists and webmasters. iCubator Labs presents ICLinx 3001 v.
etcetera allows you to search the web directly from your browser bar and take control of popup windows. Able Submittter was designed to save time and help Webmasters in their site promotion process to search directories and engines. Re-Search is a new search product that provides a wonderful way to search the Internet.